It is certainly the most popular tourist attraction in Chandigarh. Situated between Sukhna Lake and Capitol complex, it is also called Nek Chand Rock Garden named after its founder. The garden has several sculptures carved out of different urban and industrial waste like mudguards, frames, handle bars, play marbles, forks, porcelain, metal wires, and auto parts. 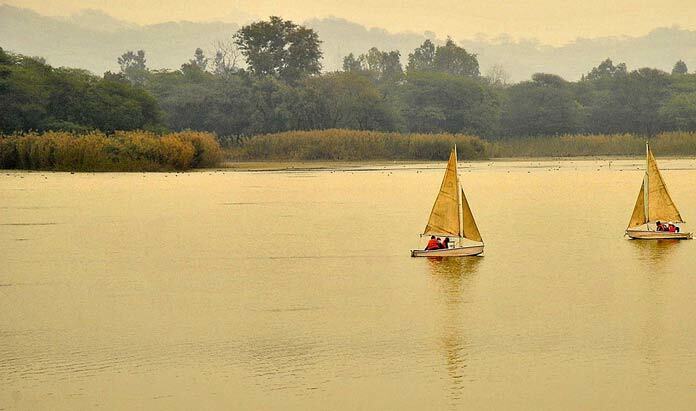 Located in Sector 1, adjacent to Rock Garden, near the foothills of Shivalik Range, Sukhna lake is another popular tourist attraction in Chandigarh. It’s a rain-fed artificial lake. Within the lake is located Garden of Silence. Sukhna Lake hosts several festive celebrations, Mango festival during monsoon being the most popular of them. Also known as Zakir Hussain Rose Garden after the name of former president of India, Rose garden is situated in sector-16. The garden is greatest of its type in entire Asia and covers about 825 varieties of rose, along with over 32500 types of other plants, herbs and trees. Leisure valley is a linear park stretching over 8 km in length starting from Chandigarh sector 1 at its northern edge and leaving Chandigarh in south. It encompasses several botanical garden, theme parks and green belts comprising of Bougainvillea Garden, Rajendra Park and Physical Fitness Trails. Situated at the foothills of Shivalik Hills in Parwanoo, Timber Trails is a great place to escape from the city life. It’s a peaceful place, where nature lovers can spend a day with their family. Cable car trips is a special attraction of the place. You can even spend the night here as the place has some of the greatest resorts and hotels in Chandigarh. Parrot Bird Sanctuary Chandigarh is located in Chandigarh sector 21. Thousands of parrots can found in the sanctuary. Located in the foothills of Shivaliks it is a camping site for adventure overs. The area is located near Mata Jainti Devi Temple. The site offers Trekking, tents, ecotours, mountain biking, Swings, car rides, bird watching, forest safaris like horse safari, camel safari and many other adventures.